Possibly HMS Exmouth after gas turbine conversion. HMS Triumph - repair ship converted from an aircraft carrier. Site of the Cadets' tragedy, Dock Road, 4th December 1951. A column of 52 Royal Marines Volunteer Cadets aged between 9yrs and 13yrs, were hit by a bus. Twenty four boys were killed and 18 injured. For many, many years, this was the worst road accident in Britain. 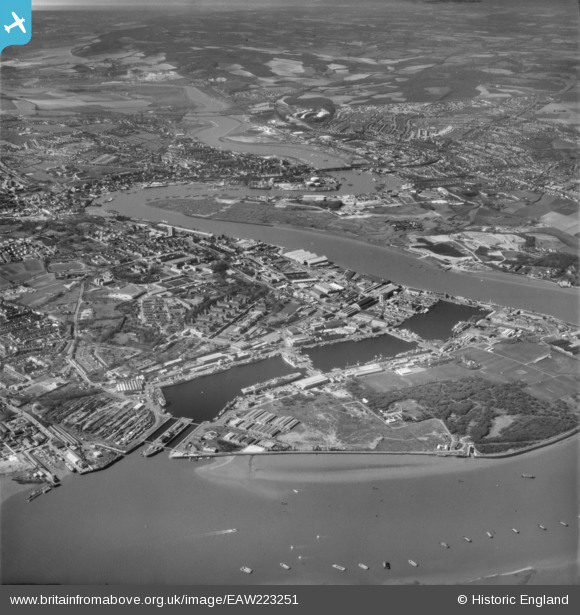 The three bridges over the Medway between Rochester and Strood. Furthest away is the frame of the cast iron road bridge, opened on the 14th May 1914 and still in use for west bound traffic today. In the middle is the east bound road bridge, opened in 1970 and built upon the piles of the first railway bridge, built in 1858 by the East Kent Railway (the London, Chatham and Dover Railway from 1st August 1859). Nearest to the camera is the current railway bridge, built by the South Eastern Railway and opened on the 20th July 1891. The original M2 motorway bridge over the Medway. I remember my parents taking me over the bridge on the day the first section of motorway opened from junction 2 to junction 5, on the 29th May 1963. My father then had an old Ford Prefect (E93A) that didn't do much more than 50 mph, happy memories of MKJ 840. Many years later, a friend of mine, a professional photographer for Sloman and Pettit at Maidstone, told me that a colleague of his had been taking official photo's of the construction of the bridge and had accidently dropped an expensive Hasselblad camera from the top of the bridge into the Medway. So if you want a free Hasselblad and can't get to the one left on the Moon, there is another a little nearer. Upnor Castle, built between 1559 and 1567 to protect Chatham Dockyard and the fleet at anchor in the Medway. It saw action during the Dutch raid on the Medway in June 1667. After then it became a store and magazine for Chatham Dockyard, and for a while was the largest and most important in the country, surpassing the Tower of London. It became a museum and was opened to the public after the Second World War. It is currently an English Heritage property.